Nowadays, it is not a need now to have your website to be responsive (meaning it has to be able to adapt to the various devices’ screen sizes, i.e. PC, tablet, smartphones), but a MUST! What Time Should You Post on Social Media? Frequency and scheduling of posts goes hand-in-hand in many ways. Both are crucial factors of your social media marketing strategy. After sharing about how frequent you should post on social media, in this article, I share on how you find out what is the most optimal time to posts. Here are some free tools that can be used to make life easier for you. Insights will be the key tool for you to track when to post. Under Insights > Post > When your fans are online, you can find out which days of the week most of your followers are online as well as down to the specific peak hour you should schedule that post. On the Twittonomy platform, you are able to see a summary of which days you post most often and what time. From there, you can gauge the success of your tweets from the number of times it was favourited or retweeted. Thus, you will find out which are the optimal times to schedule your twitter posts. There is no straight answer. As like most things on social media, we need to do a lot of guess work, but we have to guess smart! Extra tip: You are also able to see who are the most influential of your followers, as well as those who are most active. You may want do some work to understand them better, on what topics interest them, so that you can further engage them so as to make them become your word-of-mouth channels, by retweeting and liking more of your tweets. Iconosquare is a great free tool for serious users of Instagram. In the above diagram, the black dots indicate when we post most often. While the grey dots indicate when your followers have been interacting. Thus, the largest grey dots are the best time for you to post! When there’s nothing interesting to watch on TV, you are most likely to watch an infomercial. Thus, when there are lesser people posting updates, tweets, photos, etc, your posts are more likely to stand out. This was mentioned by Peter Bray from Moz. Some email marketing specialists follow a similar line of thinking. You could see greater open rates and higher clickthroughs when your email is one of the only few in the inbox. Being one of the lone voices in the inbox could prove beneficial. The same could be said for social media. Maybe you can try posting during the ungodly hours and monitor how are the results. Remember, social media is always about testing, experimenting, iterating, and improving. How often is too often to post on your social media channels? Many of us marketers face this problem. We want to connect with our fans, let them be constantly reminded of our company, brand, products and services. Yet, we are afraid of over-posting and getting on their nerves. Everything is going mobile. 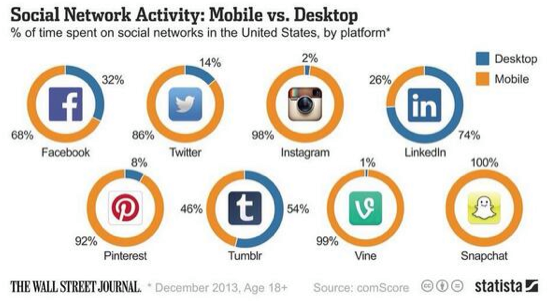 Most users access social networking channels via their mobile. Even for websites, it is a MUST now to build them responsive so it fits nicely onto a mobile or tablet screen. Have you made sure that all your digital channels are optimized for mobile viewing?